Editor’s note: Updated May 31st, 2018. 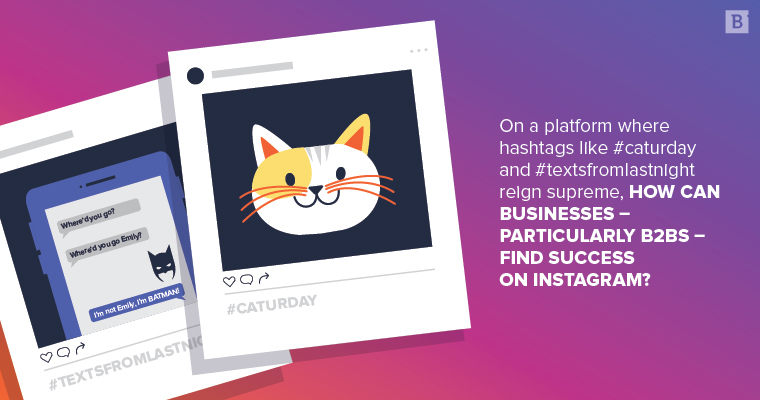 On a platform where hashtags like #caturday and #textsfromlastnight reign supreme, can businesses – particularly B2Bs – find success on Instagram? With 800 million active users per month, there are bound to be folks on Instagram interested in the products or services your company offers – even if you think your business is boring with a capital B.
There’s a lid for every pot. Let’s say, for example, that you manufacture industrial duct tape. (Yawn. Just kidding.) While you might not see the same steep uptick of new followers as a B2C fashion or travel brand would, you do have the ability to build an engaged following and nurture prospects down the funnel. It’s all about understanding the platform, knowing your audience and being authentic. Instagram is a tool to convert followers to customers. Get users with high commercial value to follow your account. Encourage your followers to engage with your content. Generate warm traffic to your website (with the intent to learn more or buy). Convert your site visitors to customers. Whereas B2Cs will often see a quick conversion from follower to customer, B2Bs should expect a longer sales cycle – Instagram is just one touch point in a research-heavy buyer’s journey. Although you’re unlikely to close million dollar deals overnight, there’s a reason B2B giants like General Electric and Cisco are active on the platform: it makes them infinitely more likeable. Instagram is a place where a corporation can let its hair down, ditch its necktie and invite its followers in for a beer. Want to humanize your brand? You’ve come to the right platform. Is your business profile reeling prospects in or driving them away? Instagram allows you to switch between multiple accounts, which means you can have one profile for your brand, and other profiles for different products or campaigns (think of what Purina did with realgrumpycat). Your primary Instagram profile photo should be your company logo. On secondary profiles where you’re promoting a product or campaign, ditch the logo in favor of a custom image. Your username is unique and searchable. If you own ABC Trucking, go with abctrucking. If that’s taken, choose a logical variation such as abc_trucking or abctruckingco. This is not the time to be witty and call yourself one_bad_mother_trucker. Your name is also searchable, although it’s not unique. Use your business name along with any variations or keywords someone might search for (i.e. Boston University BU). You only have 150 characters—make every word count. Business profiles should utilize their extra fields for phone number, email and address (these don’t count toward your 150). The alternative is typing those contact details in the bio section and eating up valuable real estate. We know a thing or two because we’ve seen a thing or two. See our most unbelievable but true insurance claims. #seenitcoveredit. Don’t forget to include a URL. You won’t be able to add links to your Instagram posts, so you need a link here. Update it on a regular basis depending on what landing page you want to direct traffic to. Don’t post blindly and hope something sticks—post strategically for maximum results. How active are they on the platform? Do they post daily? Multiple times per day? How big is their following? What type of content are they posting? How much engagement are they getting? What posts are getting the most likes and comments? Why? What industry terms and hashtags are they using that you should be using too? Find common threads—if four of your competitors post videos and have 100k followers each, whereas competitor five posts only photos and has 20k followers, you can glean that posting videos in addition to photos can help you grow your follower count. When you understand your audience, you are better equipped to serve up content that resonates. And it’s mission-critical you post content that inspires engagement. Why? Because Instagram doesn’t display posts chronologically—instead, it relies on an algorithm to show you the content it believes you’ll be most interested in. If your content incites likes and comments, there’s a better chance your future content will be shown in users’ feeds. Timing matters as well. If you post when your audience is offline, even the best content is dust in the wind. Post when your audience is most active online to generate maximum reach. What brands do my audience follow and engage with on social media? What industry or industries am I best equipped to serve? Who are the top influencers in my industry? What are the top three pain points I solve for my clients? Where are my buyers located? When is my audience most active online? Moz recommended doing some hands-on research. Visit industry blogs and discussion forums and ask commenters if they think your content ideas are unique, valuable and shareable. If so, run with them. If not, head back to the drawing board. Some social media marketers will tell you to post to Instagram 3-4 times a day for best results, and while that’s a good general rule of thumb, what matters most is consistency. If your followers rely on you to post 5 times a day, but then suddenly you scale back to once a week, some of them are going to jump ship, and you’ll notice a dip in your engagement metrics, too. When you’re starting out, begin by posting at 9 a.m., 12 p.m. and 5 p.m. Check your Instagram analytics and plan to post your best, most important content at the times that show the most growth. If you discover lackluster engagement at 9 a.m., try posting earlier or later in the morning until you find your sweet spot. It’s important, too, to never grow complacent; test and tweak posting times on a regular basis because what works one month might not work the next. Note: If the majority of your target audience is in a different time zone, you need to post at the optimal times according to their time zone – not yours. While Instagram allows 30 hashtags per post, many experts suggest using 5-10, and switching that number up from post to post. As Hootsuite pointed out, using 30 hashtags on every single post not only makes you appear desperate, it attracts the wrong kind of follower—users who hope you’ll follow them back and have no intent to purchase. Don’t forget to investigate your data. Are your Instagram posts featuring 15-20 hashtags earning the highest number of comments, likes and shares? If so, you’ve found your happy place. Instagram’s algorithm doesn’t like to see the same ol’ hashtags day in and day out. In fact, this could make your account appear spammy and land you a Shadowban, which is basically Instagram purgatory—your followers can see your posts and hashtags, but those hashtags are no longer able to be discovered by non-followers. If you only remember one thing from this section let it be this: Always use researched hashtags. Boost your organic reach by choosing hashtags your audience will be searching for. This way you can connect with folks who are specifically interested in your niche. Use a tool like Hashtagify to discover related hashtags. If you sell bedding, for example, type #bedding in the search bar to return related suggestions like #homedecor. Similarly, Keyhole allows you to track hashtags in real time and discover related hashtags in your niche. A whopping 70% of Instagram hashtags are branded, aka company-specific (think CocaCola’s #shareacoke or Always’ #likeagirl). As a business, incorporating a few branded hashtags into every Instagram post is smart because they set the stage for user-generated content, which other users trust. Invite people to use your branded hashtags when they mention you online. The other type of hashtag is the community hashtag, which is not company-specific (think #instagood and #healthy). Community hashtags can be further categorized as related, local, event and holiday. Does your industry have an annual conference coming up? Using event hashtags is a method to connect with industry insiders and event attendees. Be sure to include the conference’s branded hashtag in your Instagram posts to build relationships with like-minded people. Depending on how many people search for a hashtag on any given day, community hashtags can be categorized as low pop, medium pop and high pop (pop = popular). You want to have a healthy mix of all three. While some think it’s best to apply only high pop hashtags, that isn’t the case. Sure, lots of people are searching for uber-popular terms like #beauty (it returns about 207 million results), however, the feed is always refreshing, which means your content gets buried quickly. On the other hand, if you use a low pop hashtag like #seethebeautyineveryday (it returns about 17,000 results) your post will remain visible in that feed for a longer period of time. One bad apple can ruin the bunch, and if you accidentally use a banned hashtag (one Instagram has deemed inappropriate), the other hashtags on your post will never see the light of day. While some, like #twerk, are obvious violations – Miley Cyrus, we’re looking at you, kid – others, like #workflow and #elevator are surprising. This is why researching is paramount. 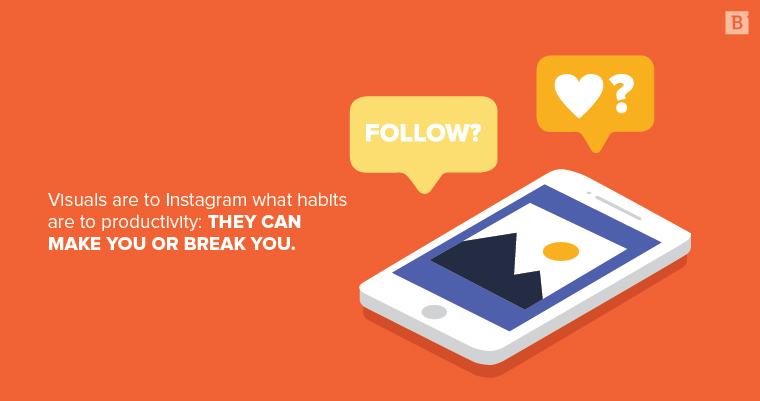 Visuals are to Instagram what habits are to productivity: They can make you or break you. From selecting a color palette to using text overlay, Instagram pros know that quality does matter. The key to winning at Instagram is posting authentic, relevant content that your target audience will want to engage with. Think of yourself as a content curator rather than a salesperson. B2C: Product photos and explanatory videos do well. If you sell lipstick, post a close-up of red lips or a video showing how to blend two shades together. If you sell babywearing wraps, post a photo of a newborn or a video explaining how to secure a wrap properly. B2B: Post photos and videos depicting office life, workplace advice or any niche images your audience would appreciate. If you provide janitorial services to tech companies, for example, think sleek skyscrapers, cutting-edge gadgets or a video of an employee answering a common question that comes up in the sales process. Always use the same filter and implement a consistent color palette for a curated profile that will stand head and shoulders above the rest. If your logo is blue, feature that hue in the majority of your Instagram posts, along with complementary colors. Doing so will solidify your branding and could even encourage more follows. Have a profile? Use ColorKuler to distill a color palette from your existing posts. Just starting out? Check Design Seeds for inspiration or A Color Story for filters and effects. If you want to get your information across in a way that will resonate with your audience, consider Implementing text overlay on custom photography. Utilize a free app like Canva, which makes creating these popular images a breeze. Not sure if a photo will mesh with your existing spread of Instagram photos? Don’t leave it to chance. Planoly lets you see what images would look like in a grid before you upload them to Instagram—for free. Boomerang lets you create mini-videos that are sure to garner lots of engagement. Unlike traditional video, Boomerangs loop back and forth, making otherwise boring tasks – like ironing fabric – funny and interesting. Whether you highlight an employee hard at work or demonstrate new uses of a product, one thing’s for sure: You’re humanizing your brand in the process. It’s challenging to post your own unique content consistently. The good news is that lots of folks are already posting awesome content that’s relevant to your industry, and many are happy to let you repost it, provided you get their permission and give them photo credit in your caption. Create a branded hashtag like #mywestelm and encourage your customers to use it when posting photos of your products for a chance to get featured on your page. Simply search the explore page for that hashtag to unearth a wealth of user generated content you can post. Going viral (or landing on Instagram’s Explore Tab) will get you tons of new followers on Instagram. You can achieve this goal by creating amazing content that people comment on and share—or by reposting already-viral content. Again, always ask permission, and always give photo credit. While visuals are the star of the show, captions are the supporting actors. Use them to connect with your audience—be humble, be funny, be helpful. You have a max of 2,200 characters to play with, however, lots of top brands use just two or three words. Length doesn’t matter much in terms of engagement, so feel free to be as concise or verbose as needed, provided your message adds value to your visual. Posting a photo of a widget? Don’t drone on about how amazing it is and how it’s going to change the world and blah blah blah. Instead, tell the story of Bob, an engineer who played a part in its development, and feature Bob in the photo. The magic happens when you introduce your followers – and potential followers – to the people behind your products. Facebook recently updated its algorithm to demote posts that use engagement bait to boost reach (i.e. “Like this post if you love to travel!”). Instagram will likely follow suit. Did you team up with another company to create your latest product? Thank them publically by mentioning that user’s handle (@skyengineering) in the caption of your product photo or video. Not only is this a classy move, it can help you cast a wider net and reach a larger audience. Some call them engagement groups, some call them DM groups, some call them pods, but no matter the name, the game stays the same: Team up with Instagram users in your niche and comment on each other’s posts with the goal being to make it to the Explore Tab to gain organic followers. How does it work? Every time a group member posts a photo or video, he or she direct messages the group to let everyone know. The others must comment on the post in a timely fashion. It encourages other users to comment, and amplifies reach. Instagram’s algorithms favor popular content: The more engagement a post gets, the more people Instagram will show it to. Think of it as a snowball rolling down the hill and gaining in size with every rotation. There’s a max of 15 people per engagement group. Haven’t been invited to join one yet? Start your own by sending direct messages to users with follower counts similar to yours (a brand with 50k followers on Instagram isn’t going to want to join a DM group with a brand with 500 followers). In real life, it’s easy to like a person who likes you. Think of that co-worker who always compliments your outfit when you pass each other in the hallway. Feels good, right? The same principle applies on Instagram—engaging with others builds and strengthens relationships. It could also get you noticed by your target audience and inspire them to follow you. Like and comment on others’ posts. Reply to comments on your posts swiftly. Tag your followers in your post captions. Ask an influencer to co-sponsor a contest with you. Following others in hopes they’ll follow you back isn’t recommended. While users might follow you back simply to return the courtesy, they’ll be less motivated to engage with your content. It’s better to let others discover you and decide to follow you on their own. Posts that disappear after 24 hours sound pretty awesome, right? That’s the idea behind Instagram Stories, which is similar to Snapchat but way more appropriate for professional use. What’s the No. 1 reason businesses need to jump on the Instagram Stories bandwagon? They’re interactive, which helps boost user engagement with your brand. Unlike photos and videos, which people view passively, you can zhuzh up your stories with fun features so folks can interact with your business in a more meaningful way. Use the poll feature to ask a question like “Is our pricing clear?” or “Does this industrial duct tape make my HVAC look fat?” It’s simple. After you’ve uploaded your image or video to Stories, simply click the square smiley face at the top to add a poll to your post. Users click yes or no, and you can see the results in real time. Not only does the poll feature let users know you value their opinions and input, it also lets you collect intel on your products, services and processes. If the majority of voters say your pricing is not clear, for example, you might want to revamp the copy on your pricing page. Want to promote a newly published e-book or announce an upcoming webinar? Instagram Stories is perfect for accomplishing both. It’s also a tool for increasing brand awareness because your stories are visible to anyone on Instagram, as long as your account is public. Feel free to post as much as you want. There’s no such thing as over-posting because – unlike traditional social media that appears in your feed – users are clicking to view your story. Paid advertising can help you reach customers at all stages of the buyer’s journey. Boost awareness of your product or service, help prospects in the consideration stage learn more about your offerings or drive conversions by promoting app downloads or product purchases. Instagram ads are customizable. Choose a photo ad that looks just like a regular Instagram post or try a video ad for a better chance of increasing conversions. Carousel ads allow users to swipe to view several photos or videos and are a great choice for e-commerce brands. You can even advertise on Stories. Twenty percent of stories return a direct message from a viewer. One reason paid ads fail is businesses don’t target the appropriate audience. If you choose to show your ad to people who aren’t likely to purchase your product or service, you might as well toss your dollars on the bonfire and call it a day. Instagram lets its advertisers target users based on metrics like location, demographics and interests, ensuring you get the most bang for your buck. You can target your current customers as well, encouraging them to buy again. When you’ve invested time and money in producing high-quality content for your business, it makes sense to promote it in every way you can—ads are one form of content promotion. When sharing our favorite Instagram tips, we’d be remiss to leave them out of the mix. When you’re using Instagram for your business, the goal is to get engagement, gain followers and convert those followers to customers. Some strategies, like conducting hashtag research or implementing a color scheme, will increase the likelihood that users interested in your niche will follow you and engage with your content. Other strategies, like buying followers, follow/unfollow, using bots or mass following thousands of Instagram accounts at once, will only do more harm than good. Remember, growing to 100k is only good if it’s organic Instagram growth. Followers aren’t worth a dime if they’re not interested in purchasing or discussing the products and services your company offers. You’re better off with 10k engaged followers who act as brand activists and refer you to others. Erin Balsa is the Managing Editor in Boston. When she's not spending an entire hour feeding her son one meatball, she enjoys reading a novel over a gin and tonic, watching reruns of The Middle and sleeping through the night.